Philip Sparks burst onto the Toronto Fashion scene with his first collection during Fashion Week in March. He's a welcome edition in a city where menswear designers are sorely lacking. I had the opportunity to ask Philip some questions for blogTO. 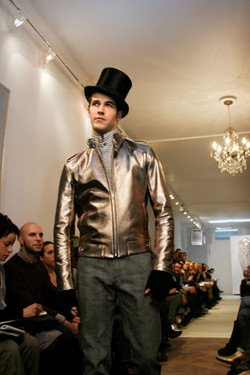 It's unusual to see a menswear designer in Toronto. Has menswear always been your passion? Yes, it has. I went to school for fashion design because I was never satisfied with what was available to me. Your clothing has an old-world sensibility about it. Did that come about from your time working in costume departments or have you always had an interest in historical fashion? I've always enjoyed browsing through antique markets, thrift shops and auctions. I think I developed my love for the old then and that's why I enjoyed theatre so much. Working in the theatre has definitely broadened my knowledge of historical fashion and influences a lot of what I do. I'm inspired by a lot of things: art, music, books, photographs and nature. I think that the key is to choose an inspiration or a couple that work well together and keep a collection focused. The Philip Sparks Line is rooted in traditional techniques. I like to keep an old world feeling to things but I also want them to be forward and practical for today's consumer. I use a lot of traditional materials to create contemporary pieces or vice versa. What's your favourite material(s) to work with? I work with a lot of wools, cottons, linens and leathers. I prefer to work with materials that can be molded or sculpted to create something structured rather than draped. Toronto and Montreal have many textile retailers who offer a huge selection of fabrics. I'll often browse what is available for immediate production. I also import fabrics from overseas. There are many textile agents still hiding in offices of many of the buildings on Spadina who show lines from Italy, the UK and other parts of Europe. Most of my leathers come from Germany. The internet is invaluable to my business. I've had many customers find me online. I also use our website as a means of selling and marketing the line. I started sewing when I was 16. I made a lot of very colourful clothing for myself. I took orders for friends and even sold to a store on Queen Street at that time. How many sewing machines do you have? I used to have five. I've actually downsized to three, because there are sixteen sewing machines, two industrial irons and several other specialized machines in the space that I work from now. Toronto isn't a major city in the fashion world for womenswear, is it different for menswear? I think that Canadians are too conservative. They're nervous about trying something that hasn't been proven elsewhere and this forces designers and artists to leave the country and make it abroad before they are recognized at home. What's your definition of style? Do you think of yourself as stylish?